DTR started business in October 1989. Our original plan being to restore, maintain and sell classic Alfa Romeo and Fiat Sports Cars, and the best source (at the time) for such cars was the sun blessed virtual desert of Southern California. Having a background in Italian cars, we diluted our passion with various other irresistible vehicles such as pre-impact Porsche 911s, which at the time were abundantly available in the same location. Despite the onset of the last recession, we created such a demand for our cars, that more time was being spent in our workshop than actually sourcing the cars themselves. As the company evolved, it became immediately apparent that the largest proportion of our efforts was to be concentrated on the beautiful fiat 124 Spider built in various guises and developed according to the strict demands of the largest world market for the model California. We quickly established DTR as the UKs leading 124 specialists, a title that we are still proud to hold today we continue to hold huge stocks of parts both new and used and always try to have a selection of the very best examples available, either as superbly maintained cars or our renowned built to order models. Due to the age of the 124, the newest of which is now approaching a quarter of a century old full restoration is essential for most examples at some stage and DTR always hold a small stock of models that can be restored to our customers exacting specification, whether left or right hand drive, with every option available including leather interiors, mohair soft tops, performance engines, upgraded suspension, chrome or impact bumper and even the original Cromodora alloy wheels in various patterns including Abarth CD30s. The launch in May 1995 of the new Fiat Spider the Barchetta made for a seamless transition as a company, from classic to modern. We imported the first of them, stripped down to the bare essentials and converted to right hand drive (just to see if it could be done) it could, but was not really financially viable, as over 100 hours went into each conversion. We converted 6 models, including one for TVs Top Gear and two for export, but no more! DTR once again quickly established ourselves as the leading specialists in the model, and imported and registered more new Barchettas than anyone else. 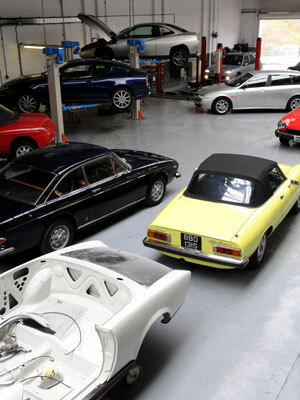 We still maintain and even now restore Barchettas concentrating on service and large stocks of new and used spares, together once again, with a selection of the very best cars for sale, prepared or restored by us. In conjuction with these core models, DTR have over the years restored many Alfa Romeos especially spiders, our favourites being the earliest 750 Giuliettas and 101s with boat tails, Kam tails series 1, 2, 3 and 4 all covered. We often hold examples of these in stock for sale too. Over the years, with our loyal customers changing circumstances, we have also restored one offs such as 1927 Fiat 509 Torpedo, Lancia Aurelia B24S Convertible, Lancia Fulvia (series 1, 2 and 3),1937 Citroen Traction Cabriolet (narrow and wide bodied), Ferrari 308 GTB, Fiat Multiplas (various), Fiat 500, Fiat 600, Fiat Abarth 750 Double Bubble, Fiat Abarth Record Monza, Ferrari 330 GTS (V12 detailed engine rebuild), Alfa Giula Spider 750s and 101s, numerous Fiat 124 Spiders including Abarths, Turbos and Supercharged versions. This year we have even restored 2 Fiat Coupe 20v turbos! We carry out all work in-house, including engine and transmission rebuilds and tuning, bodywork including aluminium welding and fabrication. We have our own machining facilities and full in-house upholstery department, including custom leather works and soft top manufacture. All quoted prices are fully inclusive and are NEVER changed without authorisation. DTR are a VOSA approved MoT testing station, with the latest automated test lane facility we are a single stop for all your modern and classic needs. DTR are able to quote for the full range of new Fiat and Alfa Romeo cars. These are UK cars, with full warranty and can be ordered and collected from our Coulsdon premises. We can usually offer substantial savings on the manufacturers list prices and you can order and buy from us safe in the knowledge that the people you speak to, will be the people who will be working on your car in the future we do not employ salesmen, all our staff are technicians with expert and in depth knowledge of the cars that we specialise in. We hope to see and hear from you soon, The Team at DTR.